Mykonos has many wonderful beaches with soft golden sand and turquoise waters. For many visitors it is a water sports paradise, as most of its organized beaches have water sports or water games facilities. At some of them, you will find certified schools where experienced instructors will help you enter the magnificent world of water sports, even if you have never tried before. 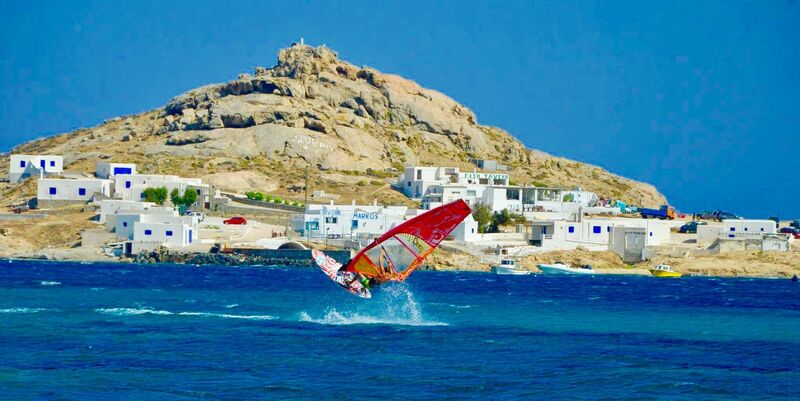 Water sports in Mykonos include windsurfing, wakeboarding, water skiing, jet skiing, scuba diving, snorkeling and kite surfing. For kids or people who don’t like adrenaline so much, there are also various water games such as tube rides, banana boats and pedal boats. If you are an experienced diver your visit to Mykonos can be an exciting scuba diving experience. The sea around the island holds a lot of treasures and a rich sea life. Some of the best diving spots are the Paradise Reef, Dragonisi and the shipwreck of Anna II. Here are the best beaches for water sports in Mykonos. If you are a water sport lover we suggest you book one of the Mykonos Luxury Villas that can be found near these beaches. A Mykonos Villa here will offer you privacy and easy access to the beach of your choice. Korfos is a windy, virgin beach just 2.5 km away from Mykonos Town. Access is easy by car or boat. There are no restaurants, bars or sunbeds here and visitors are mostly windsurf lovers. Ornos Beach, which is much more organized, is within a walking distance and has facilities for a meal or a coffee. 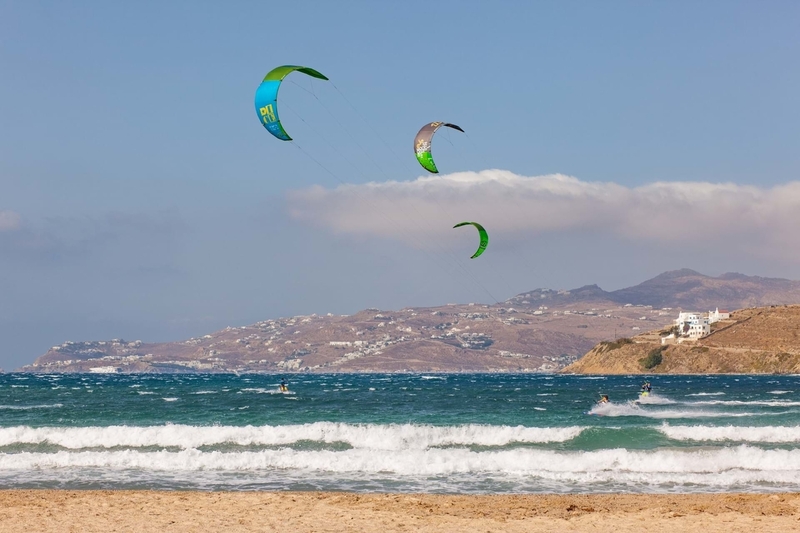 Korfos is the ideal beach for windsurfing and there is a kitesurf school at the site. This is one of the few beaches visitors prefer on the northern shoreline, as strong northern winds make sunbathing or swimming difficult on this side of the island. Ftelia has a few restaurants including the all-day beach resort Alemagou where you can rest and enjoy a meal or a cocktail. At Alemagou you can also rent sunbeds and umbrellas, as the venue is somewhat protected from the winds. Ftelia is one of the most favorite spots for windsurfers. 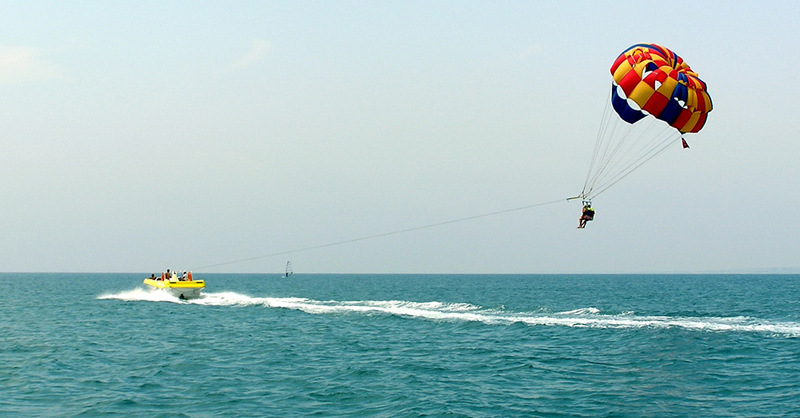 A variety of water sports can be found here, such as jet ski, water ski, scuba diving, windsurfing and wakeboard. Kalafatis is a family-oriented beach and kids can also have fun with tube rides. Half of the sandy beach is organized with restaurants, sun beds and umbrellas and half of it is free for guests to throw their towels on the sand. Although it is one of the most distant beaches from Chora, it is easily accessible by car and has a big parking lot. Platis Gialos is a very well organized beach near the famous party beach of Psarou. 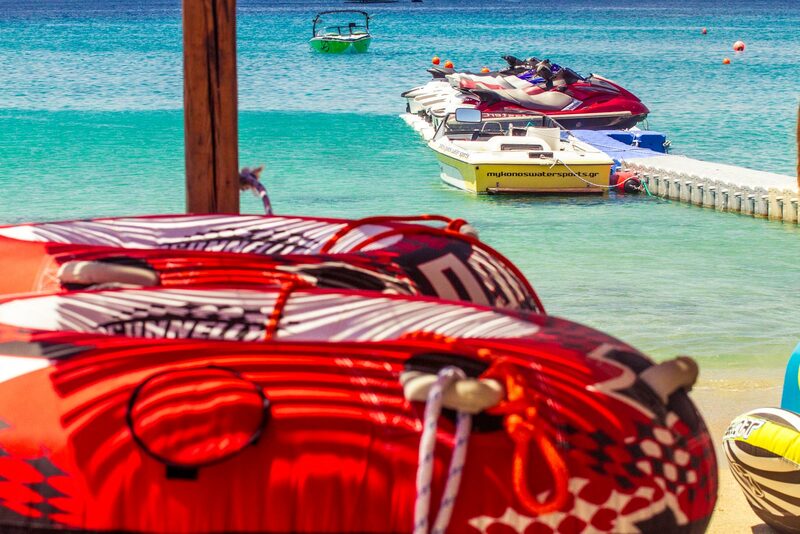 A big range of water sports and water games are available here, including jet ski, water ski, wakeboard, wake skate, wake surf, snorkeling, canoes, tube and banana rides. For visitors who want to try something new, there is a water sports school with qualified instructors to show you the basics and how to stay safe in the sea. Platis Gialos is a family friendly beach with a shallow entry to the sea and a lot of facilities to have a meal or a coffee. Some of the restaurants offer sun beds and umbrellas for rent. There is also a supermarket, kiosks and a boutique on the site. Many celebrities and VIPs choose Elia beach for their sunbathing or swimming, as it is fully organized, not very crowded and has everything for a relaxing day next to the sea. Elia is the longest sandy beach in Mykonos. Facilities include a playground for kids, restaurants and cafes, sun loungers and umbrellas. Nudists have their own spot here, at the one end of the beach. 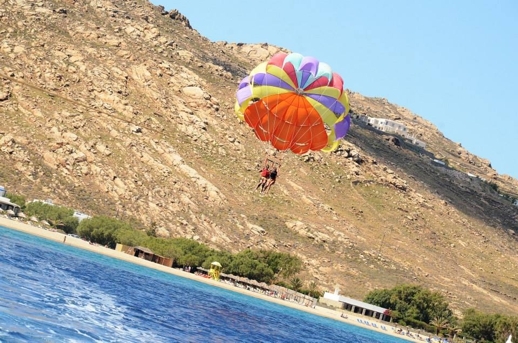 Water sports that can be found at Elia are jet skis, water skis and para-sailing. Agrari is a quiet beach, not far from Elia. There are only one restaurant and one bar here and the landscape is rather wild. Half of the beach is rocky making it ideal for snorkeling. Agrari has a water sports school and a few sun beds and umbrellas. that can be found near these beaches. A Mykonos Villa here will offer you privacy and easy access to the beach of your choice.